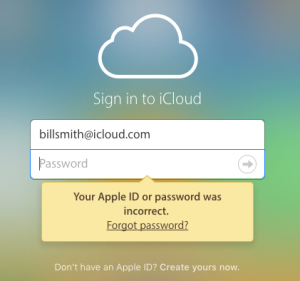 Your Password: Apple ID, iCloud or iTunes Store? As we all know, having to remember a password is a pain in the neck. Keeping track of them is hard enough, and that doesn’t even count the various requirements (minimum number of characters, the inclusion of caps, numbers and other variables) that all your different websites dictate. Trying to keep things simple is near impossible; the best you can hope for is manageable. For some strange reason, the one that gives people the most trouble is the Apple ID password. Perhaps it’s because it has multiple names – Apple ID password, iCloud password, App Store password and iTunes Store password, among others. In addition, it has a number of requirements – must be eight (or more) characters long, have one number and one cap. Oh yeah, and if you changed it within the past year, you can’t have a password you had used previously. All which adds the stress of keeping organized. Allows you to sync your contacts, calendars, notes and (Apple-based) email accounts. Lets you purchase from Apple’s iTunes Store, App Store and iBooks Store. Enables photo sharing between your Apple devices. To add to the confusion, your current email address can be used as your Apple ID. So, to put that into perspective, if your email address is user@gmail.com, your Apple ID could also be user@gmail.com. BUT (sticking with the above example) – if you’re using your Gmail address to log into anything Gmail related, then you would use your Gmail password. If you’re using your Gmail address as your Apple ID, then you would use your Apple ID password. NOTE – these passwords are probably different! And if your Amazon account also uses that Gmail address, there’s a (potential) third password in the mix! So, that’s just one example of the confusion that can ensue. This is exactly the point where most people lose the plot. Whatever method you use to document your passwords, confirm that you have differentiated between your email password and your Apple ID password (and Amazon, and others). But, if you’re forced to reset your Apple ID, go to www.icloud.com and click the “Forgot Apple ID or password” link. That will give you a choice of retrieving your Apple ID or resetting the password. You will have the option of receiving an email or answer the security questions. Go for the email; for some reasons, the question option rarely works. Neither method is working for you? Then throw in the towel and call Apple. They’re pretty good when things deteriorate to this point. Oh, and once you change your Apple ID password, you have to remember to change it on all your devices `that use it (Macs, iPhones, iPads, iPods, Apple Watch). A real chore, but if I have to deal with this stuff all day long, you can cope with it for a few minutes.